The W.O.C. (Weapon of Choice) Stubble is like the standard W.O.C just a little bit chubbier. The W.O.C. (Weapon of Choice) Stubble is a high performance shortboard for fast, responsive, rail to rail surfing. 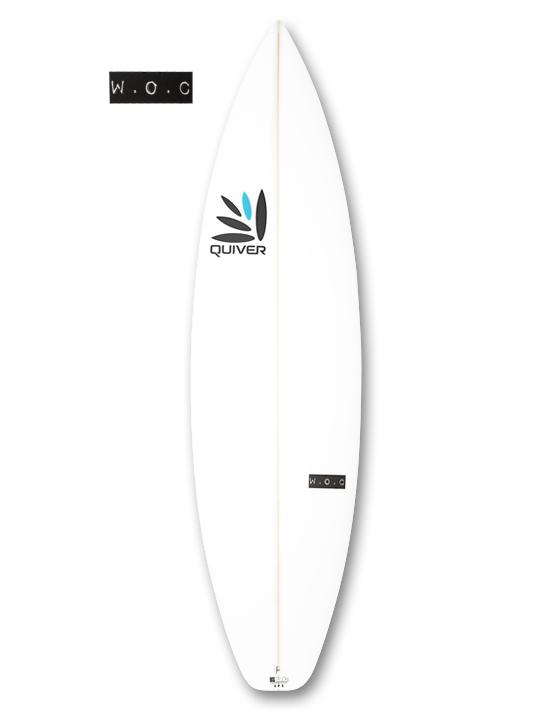 Built for average to good surf in the 2-6 foot range. 2 to 3 inches shorter than the normal Weapon of Choice, 3/8″ to 1/2″ wider and a bit thicker 1/16″ to 1/8″. The W.O.C. Stubble is the team guys favourite board and heavily tested in Indo waters. Available in various tails and bottom concaves. Tell us what you want to do and we'll make the W.O.C. do it! The below dimensions are guidelines and we can completely customise a W.O.C. board for you. 6’ 3" 18 5/8" 2 3/8"
Product ID: 452 Category: Boards.